Local teachers Brad Skoglund and Randy Ziemer were among the 160 educators honored in October at the 13th annual Leadership in Educational Excellence banquet and recognition event. Thirty-nine school districts were represented on Wednesday, Oct. 27, and nearly 500 people attended the event at the St. Cloud Civic Center, including Commissioner of Education Alice Seagren. Paynesville teachers Brad Skoglund (left) and Randy Ziemer (right) attended the 13th annual Leadership in Educational Excellence banquet in St. 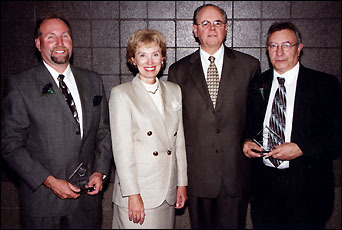 Cloud in October with Commissioner of Education Alice Seagren (middle left) and Dr. Rob Cavanna (middle right). In 13 years, over 1,800 educators from central Minnesota have been recognized at the annual event, which is organized by Resource Training & Solutions, represented by executive director Rob Cavanna. Ziemer, in his 35th year, teaches English at Paynesville Area Middle School, and Skoglund, in his 19th year, teaches health and physical education at Paynesville Area High School.